Calling all early career plant scientists! 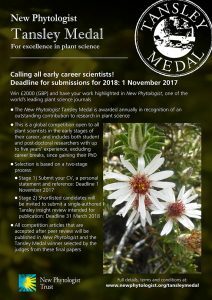 The New Phytologist Tansley Medal is awarded annually in recognition of an outstanding contribution to plant science by an early career researcher (student and post-doctoral researchers with up to five years’ experience since gaining/defending their PhD are eligible). The winner will receive a prize of £2000 (GBP) and will author a Tansley insight review that will be published in New Phytologist, accompanied by an Editorial announcing the winner and finalists. The application deadline for this year’s competition is 1 November 2017. The Tansley Medal award is an opportunity to recognise an outstanding scientist in the early stages of their career, and supporting the next generation of plant scientists is one of the main activities of the New Phytologist Trust. Please support us in this endeavour by spreading the word to anyone you know who might be eligible to apply for the Tansley Medal award. If you have any queries regarding the medal or the submission process please do not hesitate to get in touch. More details on the Tansley Medal can be found at: https://www.newphytologist.org/tansleymedal.